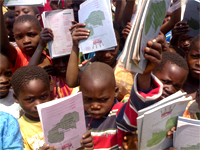 Zambia’s epidemics of HIV/AIDS have created many orphans. With infections rates currently estimated at 15.6% of people aged 15 to 49, it is clear that many more children may lose their parents. An orphan is defined in Zambia as a child below the age of 18 years who have lost one or both parents. A single orphan has lost one parent, while a double orphan has lost both. A maternal orphan has lost their mother (but may not still have their fathers), whilst a paternal orphan has lost their fathers (but may or may not have their mothers). 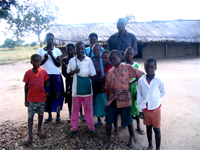 Besides, of orphans, there are many other extremely vulnerable children in Zambia. Although we recognizes this no common understanding or definition of vulnerability, either as a general condition or specifically in terms of its manifestations. Amongst children. However, the various components of this situation Analysis all point to various forms of vulnerability in Zambia today. Usually, children’s vulnerability is inextricably linked to poverty. As a direct response to poverty, children may be involved in work, either at home or outside. This work may keep them from school, and may be extremely dangerous. Girls in particular may bear heavy responsibilities for caring for younger siblings and for sick parents, depriving them of the opportunity to go to school, and placing unimaginable emotional burdens on children as young as 10 years. 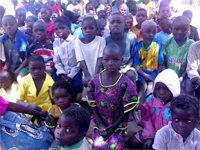 In Lundazi District of the eastern province of Zambia Rising Fountains Development Program (RFDP) is assisting the Orphaned and Vulnerable Children (OVC) in provision of Food stuffs, School requisites, Clothes, Psychosocial counseling support, Provision of livelihood skills training. Helping children cope with loss. Bereavement, counseling and peer support will give young people the opportunity to express their feelings and talk with others who are in a similar situation. Recreational, sports, and arts programs will allow children to play and be children again and create an opportunity for information sharing and support. Education support to children in school. Most distressing effects of HIV/AIDS is the increasing number of children leave school because their parents or caregivers cannot pay school fees. RFDP will provide school fees, cover the cost of uniforms and books, and negotiate with schools to eliminate or reduce fees, or help children get the food and counseling they need to be able to learn. RFDP will help children stay in school. Livelihood Opportunities for grown up OVC and care givers. Poverty often prevents potential caregivers from being able to take in children in need. This situation makes youth vulnerable to prostitution and labor exploitation as they struggle to support themselves. RFDP will provide income-generating activity for caregivers, offering micro credit loans and small business training. Others will be provided with life serving skills such as beekeeping and honey processing, Timber processing, Vegetables production, carpentry and tailoring especially those that are heads of households. Most caregivers of the OVC are vulnerable so much that they cannot provide for the OVC. Caregivers who are elderly or ill often need assistance and provide relief so Caregivers can continue to support their families while knowing their children are well cared for. Therefore the organization through this project will provide food, clothes, blankets and soaps. Every HIV new infection puts increasing number of children at risk. Education is the key to prevention. Rising fountains through its existing structure specifically the Outreach workers will provide HIV/AIDS education in all the catchments of the project areas. They will work within the culture of the communities, use peer educators and address myths about HIV/AIDS. The involvement of young people who are at highest risk for becoming infected is the key to building community awareness, increasing voluntary counseling and testing and changing sexual behaviors to reduce the spread of the disease. As long as people are ignorant of the needs of the OVC, vulnerable children will be left uncared for. The communities are going to be educated about the responsibility they all share to protect the OVC. RFDP will facilitate the formation of Orphan Care committees (OCC) that will bring together the cross section of the community members to identify children in need and develop a plan of action. The program will help to ensure that children and their families receive the acceptance and support crucial to their survival. The children receive proper health care, food, shelter and clothing. The children don’t become victims of neglect and child abuses. The restoration of children rights to basic needs. 895 children on our register have been assisted through the distribution of school uniforms, blankets, second hand clothes, soap, books and pencils and the payment of school fees. 40 caregivers and 40 psychosocial counselors have also been trained in the project area. 18 Orphan Care Committees were formed across the district and are currently operational.